Sonia Romero created 13 artworks documenting her observations of MacArthur Park as an urban oasis. Sonia's designs reflect MacArthur Park as layered, diverse, and dramatic in simplified renderings drawn from observed park activities. 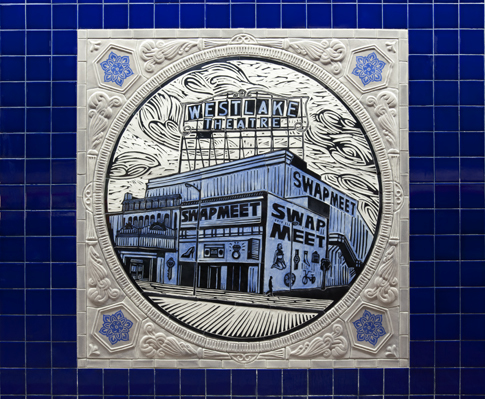 The ceramic mosaic tile mural is divided into 13 panels installed along two facing mezzanine walls representing both halves of the park separated by Wilshire Boulevard. Each artwork contains a black and white tableau centered in a circle contained within a square panel. The border space between circle and square is glazed in a cement gray color to represent industrial building materials and includes alternating art deco motifs in the corners. 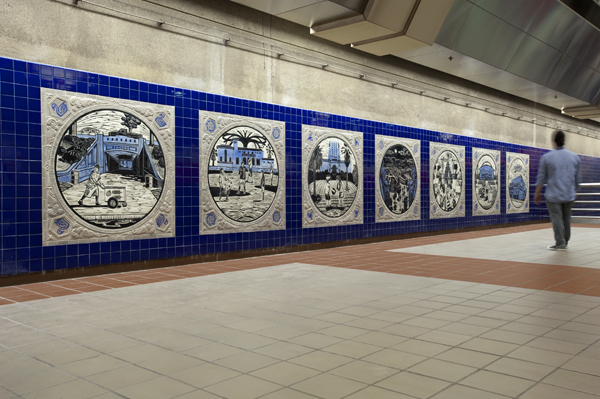 The motifs were discovered throughout the park and neighborhood. Also included are significant historical buildings throughout the park's 120-year history. 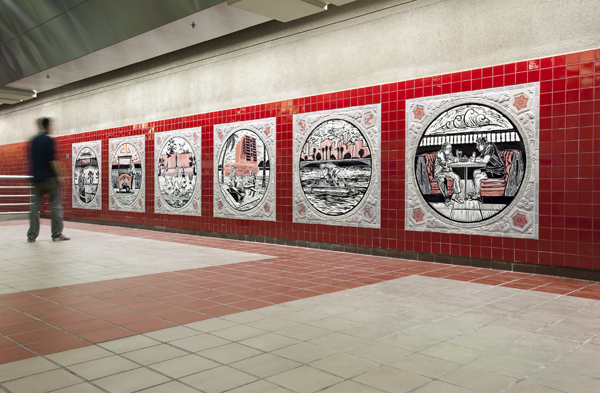 The ceramic mosaic panels were created by the artisans at Mosaika Art & Design studio in Montreal, Canada. "I found the story of the park and its fluctuating energy stimulating and intriguing. I developed my concept around the idea that MacArthur Park is an urban oasis. It was my goal to create a public work, which celebrated the 120-year-old history of MacArthur Park and the people who make use of it." SONIA ROMERO is a graduate of the Los Angeles County High School for the Arts and holds a BFA from the Rhode Island School of Design. She lives and works out of her Northeast LA studio, She Rides the Lion. 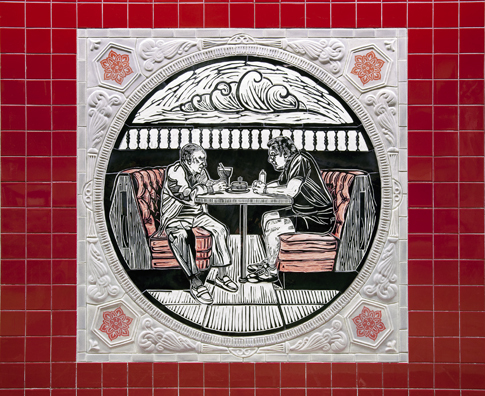 Exhibition highlights include her debut solo show at Avenue 50 Studio, a printmaking retrospective at Self Help Graphics, and the inaugural solo exhibition at the new Vincent Price Art Museum at East Los Angeles College. A recent public art piece, Tierra del Sol hangs in the entry hall of the Dennis P. Zine community center in Canoga Park. Along with offering youth art workshops for the HeArt Project, she has worked with youth to complete four large-scale art installations at East LA pools for the LA County Arts Commission.